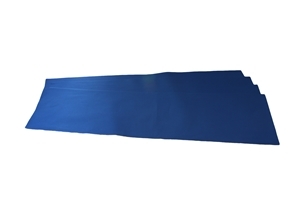 This quality fabric is perfect for making your FRC robot bumpers. It is excellent for iron-on team numbers and logos! Robo Promo offers bumper material in both red and blue. It comes in a single piece of 161". In the heat of competition, you can use a competition cover to easily change between red and blue. These custom made, tailored fit bumper covers easily slide over your existing bumpers and are made of 420 denier nylon. 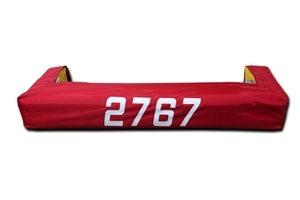 There’s no worry taking bumpers on and off between matches when you have these handy covers. There is no sagging or loose bumper material to worry about, and it adds an extra layer of protection. Measure from point to point (outside corner to outside corner) on your finished bumper. Submit your dimensions, both length and width of your bumpers needing to be covered, to ensure a tight fit to your already finished bumpers. Once we have all the needed dimensions for your bumper covers, we will custom make them! The Super Tough Bumper Material is made from 1,000 denier Cordura fabric. This quality fabric is perfect for making your FRC robot bumpers. It is excellent for iron-on team numbers as well, and this includes plenty of material to make all four sides. Robo Promo offers bumper material in both red and blue. It comes in a 200” single piece. Don't forget to include 8 sets of custom numbers and 8 iron-on service in your order! Make sure to check out our video of bumper Basic Construction and Easy Bumper Attachment before you purchase your material to find out what you will need for your bumpers. *Rookies will receive free red and blue material in approx. 161 inch rolls-- Limit One Voucher Per Customer* Use voucher code from the Kit of Parts at checkout to get your bumper material free of charge ($36 value). IMPORTANT! You must INCLUDE YOUR TEAM NUMBER to verify your status as a rookie team for your voucher code to work, otherwise your order will not be processed. This quality fabric is perfect for making your FRC robot bumpers. 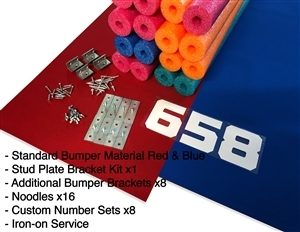 It is excellent for iron-on team numbers as well, and this includes plenty of material to make your bumpers. Robo Promo offers bumper material in both red and blue. It comes in a 200" single piece. Get 200 inches of better, slicker, stronger material! This super slick and super tough material lets you slide out of the tight spots. Our material is 420 denier Nylon (twice as thick and more slick than common fabrics used). This quality fabric is perfect for making your robot bumpers. It is excellent for "iron on" team numbers, and the material is available in both red and blue. It comes in a 200" single-piece.